If you were a mechanic with real talent and inspiration or brought the same amount of enthusiasm as knowledge about car engines, there was one job location that was right at the top of your list in the 1950s. Zuffenhausen. Employees at Dr. Ing. h.c. F. Porsche KG knew their engines inside out, right down to the smallest screw. At the exclusive sports car manufactory in North Stuttgart, every engine for the Porsche 356 was completely assembled by one employee, from the unmachined engine block through to the finished engine, requiring many hours of manual labour. There were no power screwdrivers, electronic torque wrenches, assembly lines or robot arms. Instead, what counted was down-to-earth manual labour, detailed knowledge and the sharp instincts of a mechanic. To this day, nothing has changed regarding quality standards, an enthusiasm for engines or a passion for sports cars. In addition, however, the production plant in Zuffenhausen today has very little to show of the well-arranged workshops where Porsche models used to be assembled. A rented hall has turned into a global corporation – and meticulous craftsmanship has given way to a perfectly timed high-tech car plant with a unique production system. Its roots go back to 1931. Ferdinand Porsche opened his engineering office in Kronenstrasse 24 in the centre of Stuttgart, directly next to the main railway station. There he carried out contract work for a number of different companies: a saloon for the Wanderer company in Chemnitz, a five-cylinder radial engine for the Phänomen-Werke in Zittau or a small car for Zündapp in Nuremberg. But soon, space in the middle of the Stuttgart basin started to run out. In 1937, Porsche had a development plant built on the northern outskirts of the big city: the Porsche Plant 1 in Zuffenhausen. It was equipped with only the finest, including a carpenter's shop, a paint shop, a sheet metal shop and assembly shops. In 1938, the company moved to the roughly three hectare site – it was the foundation stone for Zuffenhausen's world fame when it comes to automobility. In the same year, the VW Beetle previously developed was ready to go into production. One year later, Ferdinand Porsche then pursued his true passion. At the beginning of 1939, he had created a sports car which was to dictate the future path of the exclusive engineering office in the North of Stuttgart: the Type 64, a study in elegance, performance, speed and comfort. Porsche had built what was known as the Berlin-Rome car for a record trip which was planned between the two capitals. However, because of the war which had just broken out, it never took place. The war was also responsible for forcing the company to leave Zuffenhausen temporarily in summer 1944. As the north of Stuttgart was an industrial centre, it was the centre of allied air attacks. 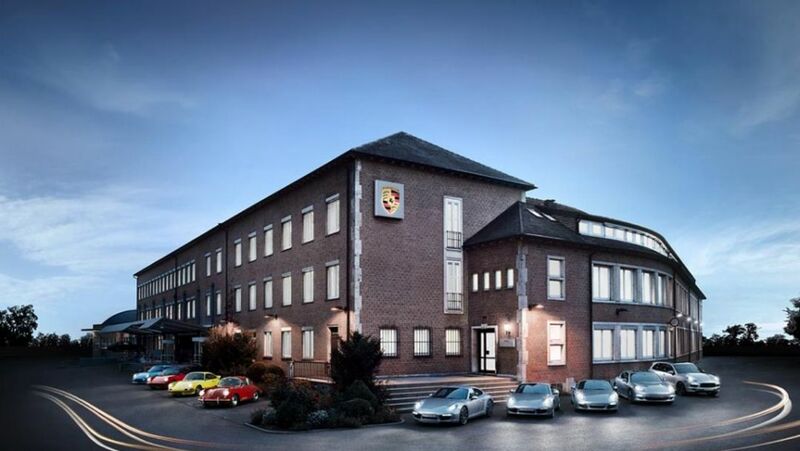 The offices and parts of Porsche production were relocated to Austria to the Porsche plant in Gmünd in Carinthia. Under the leadership of Ferry Porsche, Ferdinand's son, the first car bearing the official emblem of "Porsche" was built at the end of the war – the legendary Porsche 356, the original Porsche, the predecessor which incorporated the unmistakeable characteristics of every later Porsche model. But the company's roots definitely lay in Stuttgart, so Porsche did its utmost to move back to Zuffenhausen in the latter part of 1949. The old factory shops, however, had been commandeered by the US Armed Forces. As a backup solution Porsche rented a factory hall from the neighbouring Reutter body plant; it was to be the new home of the 356. In March1950, the time had come. There it stood, like the sign of a new beginning – a paradigm of reconciliation, reconstruction and the economic miracle. The very first Porsche 356 from Zuffenhausen sparkled in the spring sun, brand new, brightly polished, exuding sporty elegance. By the end of the year, it would be followed by a further 368 units. Not only did the sales figures start to soar from then on, the extensions to the production shops in Zuffenhausen were also witness to the success of the sports car manufacturer. The well-known Stuttgart architect Rolf Gutbrod designed the Porsche Plant 2. It was completed in 1952. By 1956, the Zuffenhausen mechanics had completed 10,000 units of the Porsche 356. Four years later, this figure reached 25,000 sports cars "Made in Zuffenhausen". In 1960, a neighbouring building was turned into Plant 3. It also housed the sales and customer service departments. The model portfolio started to grow. In 1953, Porsche created a classy small brother to join the original model 356: the 550 Spyder. Then came the birth of a legend in 1963: the first 911. Economic success came on the heels of technical success. Porsche acquired the Reutter body plant with its roughly 1,000 employees. From then on, the way forward was a steep upward path. Porsche KG, which changed its status to Porsche AG in 1972, continuously expanded the plant, investing in additional assembly shops and test benches. Today, the site in North Stuttgart comprises six Porsche plants, a Porsche Centre, the Porsche Museum and much more. The intelligent use of space and creative solutions allowed Porsche to create perfect conditions, despite the confined space. Multi-storey production shops or sky bridges between streets for long production lines are perfectly normal for the over 7,800 employees at the site. Today, 200 sports cars are produced here every day. A total of 29 derivatives with a shear endless number of possibilities catering for the wishes of individual customers are assembled on the same production line. And something that is unique in the entire car industry: even the racing versions of models are produced on the same line. Then there are the petrol engines for all Porsche model series. "Porsche is on course to develop from a growing medium-size company into a large corporation. We will continue to expand our strengths in the flexible production of highly customised cars," says Dr Oliver Blume, Chairman of the Executive Board. "The main plant in Zuffenhausen is the hallmark of the Porsche brand and is regarded as the epitome of top quality, productivity and flexibility in production, not only in the car industry." Porsche is growing in Zuffenhausen. Since 2011, the area of the plant has more than doubled, from 284,000 to 614,00 square metres, as a result of purchasing the former Layher, Deltona and Daimler sites, among others. By the beginning of 2016, a new engine plant will be built on an area of only 10,000 square metres. In addition there will be a completely new body shop. The plant already has a cutting-edge paint shop, erected at a cost of 200 million euros. The company has also thought of the next generation. At the end of 2013, work started on building the new Training Centre, which was then opened in autumn 2015. Everything comes together in Zuffenhausen. Craftsmanship and high-tech production, global corporation and responsibility for every single employee, the main plants and the Porsche Museum. The history of the sports car. And its future. For example the Mission E. More than 1,000 new jobs will be created alone in Zuffenhausen for the new electric Porsche which will be launched at the end of this decade. The company is investing about 700 million euros for this at its headquarters – in addition to 800 million euros already earmarked to safeguard the economic future of the site. Among other things this includes a new paint shop and a separate assembly line. There are concrete plans to expand the existing engine plant to produce electric motors and to extend the existing body shop. So in future, Zuffenhausen will remain the centre of the Porsche world.